From 7pm on Friday 11 November, the Costa Rica Senior National Team will grapple with their Trinidad and Tobago counterparts in Russia 2018 World Cup qualifying competition at the Hasely Crawford Stadium in Port of Spain. But who will the Trinidad and Tobago football squad be fighting? The answer would probably vary depending on when you ask and who the question is directed to. Some days, it is the weather. This evening, Trinidad and Tobago coach Stephen Hart expects to take his squad to St Anthony’s College to train in anticipation that the overcast conditions will lead to rain. And rain, almost certainly, means Hasely Crawford stadium facility manager Anthony Blake would deny the squad access to the match venue, so as to ensure it is in good shape tomorrow. 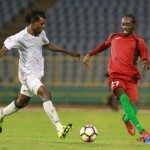 On Tuesday evening, the national team had to use the Larry Gomes Stadium in Malabar—although, at least, they were able to borrow a bus route pass from Trinidad and Tobago Football Association (TTFA) president David John-Williams, whereas they were stuck in rush hour traffic in the past. The Warriors had asked and were refused permission to use the St Mary’s College ground in St Clair to train on Tuesday, due to an Intercol fixture between Malick Secondary and Maple Leaf International. It seems safe to say that Hart is dissatisfied with the facilities afforded to his team. 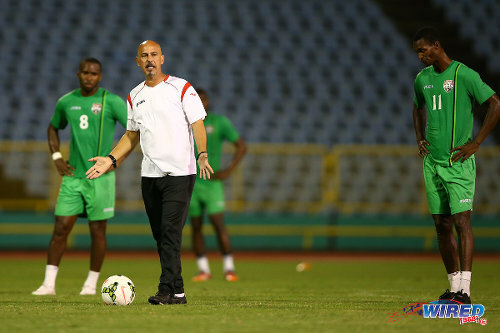 Photo: Trinidad and Tobago head coach Stephen Hart (centre) makes a point while midfielders Ataulla Guerra (right) and Khaleem Hyland look on during a practice session in March 2015. “[The facility staff] have to go to work. This is collective. They should call the coach [and ask] how you want the grass cut? That is what happens with big teams. On other days, the insecurity comes from above, as rumours continue to swirl that Hart, his assistant coaches Hutson “Barber” Charles and Derek King, or team manager William Wallace—and sometimes all of the above—are set to be replaced. Wallace admitted that on Tuesday night, just three days before they open their CONCACAF Hex campaign against the country’s toughest foe in the confederation, the coaching staff asked two TTFA VPs about their own futures. “Obviously we have heard the rumours and obviously it brings a certain level of anxiety to people,” Wallace told Wired868. “Mentally it is like you are going game to game. So, yes, there is a certain amount of anxiety among staff members. 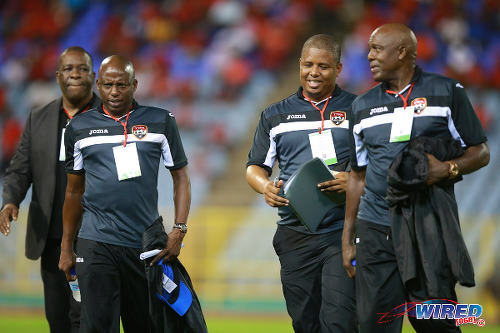 Photo: Trinidad and Tobago National Senior Team technical staff members (from right) Michael “Brow” Maurice, Derek King, Hutson “Barber” Charles and William Wallace exchange ideas before kick off against Nicaragua on 13 October 2015. The tension between the squad and the administration extends beyond the job security of the technical staff. And the little things count. The Costa Rica squad fly in tonight on a chartered flight and leave right after the match to prepare for their second qualifier against the United States in San Jose on 15 November. In contrast, the Trinidad and Tobago outfit will catch a commercial flight for Panama on Saturday evening where they will overnight before getting to Honduras at 1.15pm on Sunday afternoon with roughly 48 hours left before kick off. And, as always, Hart’s men will fly economy—unlike Trinidad and Tobago’s World Cup 2006 team, which travelled business class throughout as coach Leo Beenhakker insisted on it. These days, there seems to be an internal war too. Hart has left his most clinical finisher and fan favourite, Kevin Molino, out of the team, after he was twice caught breaking camp to party. On at least one occasion, he took teammates Joevin Jones and Mekeil Williams along. And there is a hint that Hart is as concerned about the effect that Molino’s behaviour can have on the rest of the team as he is with the infraction itself. 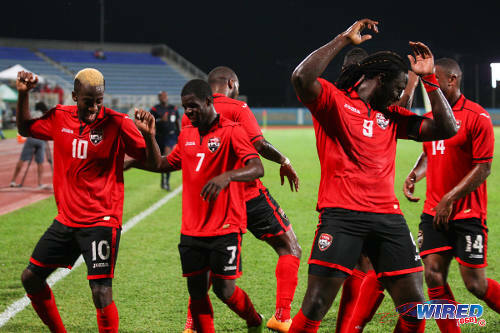 Photo: Trinidad and Tobago scorer Kevin Molino (far left) leads teammates Hughtun Hector (second from left) and captain Kenwyne Jones (second from right) in a goal dance during 2014 Caribbean Cup qualifying action against Antigua and Barbuda. “If you let one go, you will have to let everyone go,” said Hart, “and the rule is we have a curfew at 11 and we are in camp. Listen, your country has paid for you to come home and this is the life we live. Last month, national captain Kenwyne Jones made an open plea for Molino to smooth things over with Hart. The Orlando City playmaker sent a written apology to the team management. But that seems to be as far as he went. “I called him last week [and] I asked him if he wanted to talk about anything,” said Hart. “I said I wasn’t calling to lecture him but I just wanted to find out if there was something going on or anything I could help with. And he said he didn’t want to talk about it. 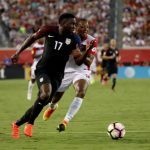 Molino’s absence will be felt even more keenly now that France-based midfielder John Bostock has pulled out for an unspecified personal emergency. Costa Rica play a suffocating high press with two mobile strikers and five midfielders snapping at opponents in an effort to win the ball in dangerous areas of the field. 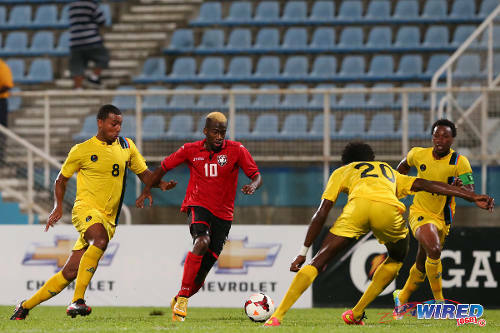 Molino and Bostock are Trinidad and Tobago’s most technically sound players. And without them, it is difficult to see the hosts attempting to pass the ball through their opponent’s defensive lines. Once more, it is likely that Hart’s most practical answer remains long balls towards his giant captain, who must hold them up or flick on into the path of runners like Cordell Cato, Levi Garcia and Joevin. But the awkward mood between the team’s captain and supporters is often thick enough to cut with a knife. 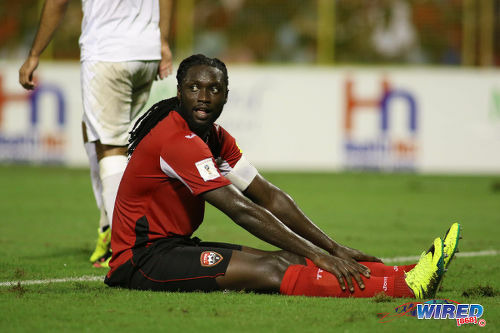 On Friday, Kenwyne will take the field with barely a half hour’s worth of competitive football under his belt in the past month, as he recovers from an injury suffered in Caribbean Cup qualifying action against Martinique on 11 October. Can Kenwyne count on fans to help push him through an arduous 90 minute test of his match fitness? “We are hoping we will get full support from the public as usual,” said Wallace. “Or even more so because of the team we are playing. We are hoping that the 12th man will be a 12th man in the true sense of the word. It is worth reiterating that Wallace does not expect. He hopes. 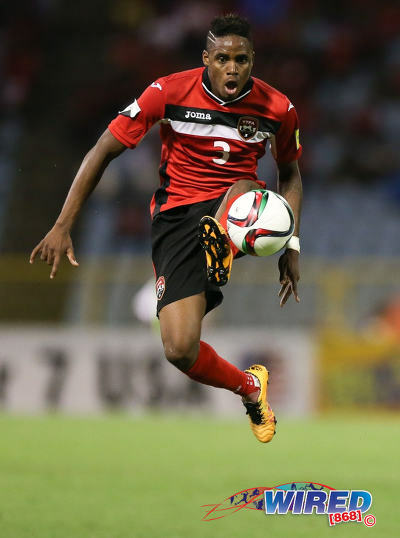 Costa Rica and Trinidad and Tobago will both take the field with players that are near to their peak ages. The average age of the Central American squad is 28, while it is 27.5 for the hosts. But there the similarities end. “Los Ticos” will have an amassed 593 international appearances rammed into their first team—78 more than Hart’s troops—with 76 goals to Trinidad and Tobago’s 43. Two of the Costa Rica players, Real Madrid custodian Keylor Navas and Celtic right back Cristian Gamboa, are involved in the ongoing European Champions League competition while midfielder Celso Borges, playmaker Bryan Ruiz and striker Joel Campbell have bags of experience in the Europe’s top domestic competitions. One of just two unbeaten CONCACAF teams in World Cup qualifying, along with Mexico, Los Ticos scored all four away goals in the second half. And that might be testament to the fitness of a team that plays an energetic relentless brand of football. They will make things as uncomfortable as possible for Trinidad and Tobago. Can the players in “Red, Black and White” dig deep to match? Photo: Costa Rica striker Joel Campbell (left) drives home against Uruguay at the 2014 World Cup. “We would need a minimum of eight people on top of their game,” said Hart. “We can carry one or two people not at their best but no more. We need somebody like Joevin Jones at his best; but not only when he has the ball. So, for Joevin and company, the fight is also within themselves. How much do these young men really want to play at the Russia World Cup? How hard are they prepared to work for it? It took no small effort to refrain from using the sobriquet Soca Warriors throughout this piece, so far. John-Williams insisted publicly that no plans are afoot to change the team’s moniker. But, according to a Trinidad Newsday article, their website and press releases have already purged the famous nickname, as they respond to a legal copyright claim by broadcaster Selwyn Melville, who is requesting compensation for supposedly coining the phrase. And, in a promo for tomorrow’s qualifier, the TTFA carefully edited out any reference to “Soca Warriors”—with, according to the football body, the permission of soca artiste, Maximus Dan. 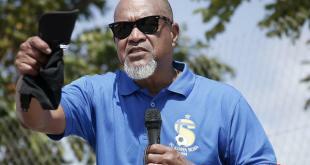 So call them “The-Team-With-No-Name” or “The-Artists-Formerly-Known-As-The-Soca-Warriors”. Or not. Call them what you like. The Trinidad and Tobago football team, of course, belongs to the people. And so—branding aside—does the Soca Warriors. Hart’s troops have slumped recently. 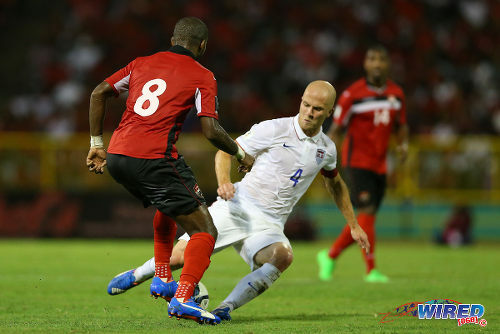 Since their goalless draw with the United States on 17 November 2015, the Warriors defeated just two nations in their next 11 outings: St Vincent and the Grenadines and the Dominican Republic. “Physically and mentally, we are struggling,” said Hart. “In 2015, we had a lot of time together going into the Gold Cup. A lot of football people didn’t give us a hope in hell but we had a decent run and that took us right through into the qualification [series]. 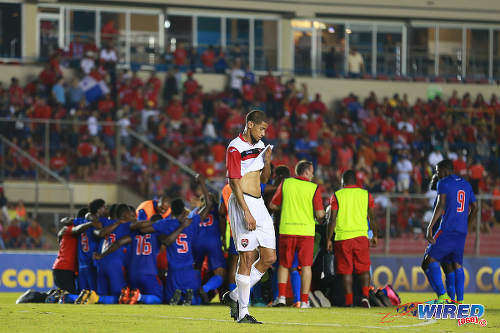 Photo: Trinidad and Tobago defender Radanfah Abu Bakr (centre) walks away while Haiti players celebrate their 1-0 win in the 2016 Copa America play off contest at the Rommel Fernandez Stadium, Panama City on 8 January 2016. Both parties eventually patched things up but it did affect the team’s Copa America playoff preparation. And their subsequent 1-0 loss to Haiti meant that, while the likes of United States and Costa Rica were sparring with Argentina and Colombia, the Warriors did not get a single warm-up game with a full strength team. A nervy home draw to Guatemala and spanking away to the US followed in World Cup qualifying action, as well as a haunting extra time loss to Martinique in the Caribbean Cup. Now, the Warriors must start from scratch again. But with the defiant Jan-Michael Williams back between the uprights, the spiky Khaleem Hyland stomping around in central midfield, Joevin’s pace and trickery on the flanks and the menace of Sheldon Bateau, Radanfah Abu Bakr and Kenwyne from set pieces, Trinidad and Tobago have something to hang their hats on. 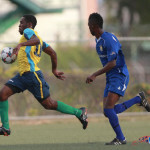 Teenaged winger Levi Garcia was a breath of fresh air against St Vincent and the Grenadines and Guatemala, earlier this year, and he would need to be at his fearless best on Friday night. 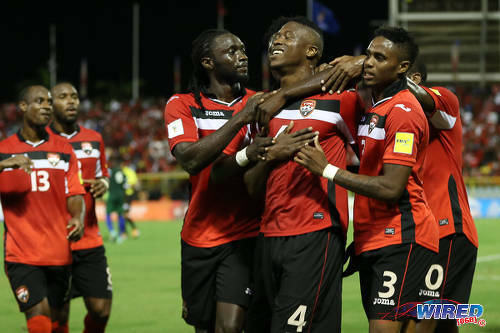 Trinidad and Tobago have never defeated Costa Rica in a senior World Cup qualifying fixture before and it is 11 years since the Warriors so much as took a point off the Ticos. But only together is there any chance of achieving. At the Hasely Crawford Stadium tomorrow, Hart will hope for a suspension to the internal rumblings and hostilities. And that all guns are aimed squarely at their formidable Central American visitors. The TTFA has booked nine-time Road March champion, Super Blue, and Jamaican dancehall star, Mavado, to perform at the contest. Football fans can certainly do with a Fantastic Friday. Next Letter to the Editor: If Warriors fans want a top performance, we should lead by example! In essence, Soca Warriors’ home field is really an away field. 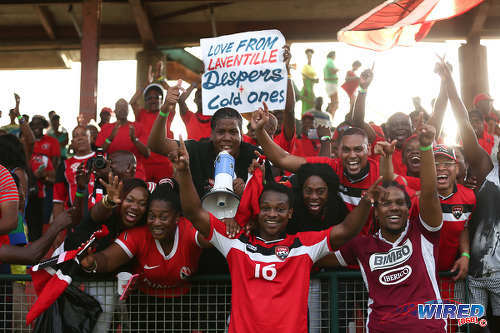 The only thing about T&T Soca Warriors’ home field advantage is the spectators, not the ‘nooks and crannies’ of the field. Kenneth – I’m really not sure that even the spectators can be deemed a home field advantage. We only cheer when something good happens or when something bad happens. In-between those two events we are quiet. It doesn’t help that the fans are ridiculously far away from the field. We need a soccer specific national stadium and fans who encourage their team on for the full 90 minutes. It’ll also help if we had a team song we could rally around. Che Abrams, I was assured that schedules have always been sent by the technical staff to not only the Hasely Crawford Stadium but to other venues as well just in case. This is a very strange rumor that I’m sure the manager won’t appreciate. The problem is simply that they don’t like the alternatives and would much rather have Plan A.
Jamaal, I think it very possible that the manager would have sent his schedule directly to the stadium’s facility manager. I don’t know that one needed to be sent to the TTFA office as well. I don’t think it odd that nobody at the office knows. But I’m happy for Cheyenne to confirm that. Hence the reason why the Soca Warriors lost the game tonight steeuuppss nutten in place as usual eh, and I am really begining to believe that my Coach Hart doesn’t know what he is doing eh, he started the game without his bestest midfielder/playmaker Boucard eh to facilitate my dictator president player Jomal Williams so the he can get some caps then when Boucard finally came on the field as the defensive midfield player, he was instead playing the game like the playmaker of which Hyland who should have been the one doing that eh and he had a very good second half game to eh, then when Cato and Jones was flanking down the flanks with plenty speed eh Mr Bound not to score is no where to be found so that they can pass the ball to him eh because he is crawling like a snail in the middle of the field eh, steeuups and then when my Coach Hart finally couldn’t take it anymore eh he finally took of Mr Bound not to score and brought on Plaza who should have came on earlier or even started because the flankers Cato and Jones would have given him the right balls to score because of his speed himself, it seems that the Soca Worries doesn’t have an identity the same as that bootleg Argentine team eh and my Coach Hart better really start to pick the right team because it really doesn’t look like our Soca Worries will be going to the World Cup 2018 in Russia eh and boy did we miss Kevin Nash Molino tonight. Them really good yes. Any manager who hasn’t given a schedule for years without consequence or remedy seems just as culpable as the people above him to be honest.. When will people start recognizing that and stop making excuses. Yeah I was now about to say today is a day that all the usual crap should be left behind . Today is about the team . Sounds like straws making camels backs break. What is check and balance if schedule isn’t sent? Absolutely, a schedule should be sent, by the way. I know I ask everybody who I could ask in the Office they said they received none.